This June, Americans across the country will commemorate their past with barbeques, baseball games, parades and speeches. Wait, June? These festivities may remind you of the Fourth of July but, two weeks before Independence Day, thousands of Americans will commemorate emancipation. June 19, or Juneteenth, honors the symbolic end to slavery in the United States, bringing new meaning to the American celebration of freedom and citizenship. As Juneteenth draws near and the nation continues to observe the sesquicentennial of the Civil War, it is important to understand the meaning of this powerful, unique American holiday. In February of 1861, a special convention in Texasa state that supported slaveryvoted to secede from the United States and become the 7th member of the newly formed Confederate States of America. For the next four years, the nation was engaged in a civil war that cost over 600,000 American lives (2% of the total American population.) During this war, the institution that had deprived generations of Africans and African Americans their freedom finally started to crumble. On January 1, 1863, United States President Abraham Lincolns stunning Emancipation Proclamation went into effect and declared that all enslaved people in rebellious territories were free. While this Proclamation gave millions of people their long-awaited liberty, thousands more remained enslaved until United States military forces could spread and enforce the Proclamation. Texas, the westernmost member of the Confederacy, remained largely untouched by war and the Proclamation. Texas even served as a refuge for many slaveholders who fled the advance of United States armies in Louisiana and Mississippi. Escaping slaveholders forcibly relocated tens of thousands of enslaved people to Texas. This flight mimicked earlier migrations of slaveholders and slaves to Texas. When Texas became a state in 1845, many slaveowners from older southern states transferred their cotton production and plantations to Texas and took advantage of the vast amount of available land. Quickly, Texas agricultural production, hierarchy, and support of slavery closely resembled that of the rest of the Deep South. While wealthy slaveowners dominated society, enslaved people were legally, physically and emotionally regarded as property. Even after C.S.A. General Robert E. Lees Army of Northern Virginia surrendered to U.S. General Ulysses S. Grant in April of 1865, roughly 250,000 people still lived as slaves in Texas. Months after the Emancipation Proclamations author, Abraham Lincoln, was assassinated, enslaved Texans were still largely unaware that the President had promised them freedom two years earlier. On June 19, that changed. After remaining Confederate forces in Louisiana and Texas surrendered in May and June of 1865, the United States military appointed U.S. Major General Gordon Granger to take command of the Department of Texas. The order was confirmed the next day, when it was printed in the Galveston Tri-Weekly News. The Emancipation Proclamationand freedomhad reached Texas. The first Juneteenth celebration was born. The road to freedom and citizenship in Texas was long and grueling, but June 19 was still a powerful symbol for African Americans. From that date on, the pursuit of equality and citizenship could begin. Americans have celebrated Juneteenth for almost 150 years, but the holiday has witnessed a lot of change. Transformations in how Americans remembered the Civil War and slavery also shaped how Juneteenth was celebrated and recognized. In the nineteenth and early twentieth centuries, racial segregation and white Southerners efforts to glorify the antebellum South hindered African-American efforts to celebrate Juneteenth. Despite this adversity, former slaves and their families strove to ensure that their struggle to achieve freedom was remembered and their victory, cherished. In the decades following emancipation, Juneteenth gave African Americans the unique opportunity to commemorate their ongoing quest for equal citizenship together. In the 1930s and 40s, war, depression and racial violence continued to threaten Juneteenth celebrations. Historian Mitch Kachun believes one could argue this period offered no compelling reason for celebrating a freedom that had limited relevance for most African Americans day-to-day experiences of racial violence, discrimination and second-class citizenship. In 1943, for example, the Richmond Times Dispatch in Virginia reported that African Americans were asked by officials to attempt no Juneteenth celebrations due to recent riots in Texas. Despite the danger, Juneteenth celebrations refused to disappear and African-American Texans who left the state brought their Juneteenth traditions with them. In the 1950s and 60s, racial tensions over the growing Civil Rights movement spilled into public debate over the how the 100th anniversary of the Civil War and emancipation should be commemorated. For some white Southerners, the Civil War centennial was a way rebel against Civil Rights initiatives. The story of slavery and emancipation was ignored in favor of celebrating Confederate milestones and military bravery. The complicated and conflicting public memories of the Civil War and slavery dampened public acceptance of Juneteenth and put potential participants safety at risk. While many African Americans continued to celebrate Juneteenth privately, public celebrations began to decline in the 1950s and 60s. While there were some significant efforts to commemorate emancipation in other ways, including events at the Lincoln Memorial in Washington, D.C. and Lincolns tomb in Springfield, Illinois, they failed to gain the prominence of other Civil War anniversaries. By the 1970s, a renewed communal commitment to celebrating African American history and culture also produced a rejuvenated enthusiasm for Juneteenth. In 1968, major civil rights leaders organized a Poor Peoples March in Washington, D.C., gathering supporters from all over the country. Discouraged by their unsuccessful campaign at the end of June, participants received a boost in morale when Texans among them suggested a Juneteenth celebration. Juneteenth was brought to national prominence as these participants brought Juneteenth traditions home with them. In 1979, Texas made Juneteenth an official state holiday. Support for Juneteenth continued to soar into the 1990s. The posthumous publication of Ralph Ellisons Juneteenth in 1999 and the appearance of groups dedicated to making Juneteenth an official national holiday increased the holidays prominence. Following Texas lead, 41 states and Washington, D.C. now host some form of Juneteenth celebration. The National Juneteenth Holiday campaign by the National Juneteenth Observance Foundation is one of many continuing efforts to make Juneteenth a nationally recognized holiday. While Juneteenth is celebrated across the nation, Juneteenth is also an intensely personal event. Its traditions are vibrant, but extremely varied. Juneteenth in Galveston, Texasone of the nations largest Juneteenth celebrations and the home of the first Juneteenthwill honor many of these traditions throughout the month of June. Public demonstrations of celebration, community and citizenship are critical traditions in Juneteenth celebrations. Segregation and racial violence haunted Juneteenth celebrations for decades so African American celebrants often struggled to find safe public spaces for festivities. As historian Elizabeth Hayes Turner states, public space became a mighty ingredient in the forming of Juneteenth memories. African Americans set out to acquire, or even buy, land for their celebrations. Emancipation parks for Juneteenth celebration began to appear across Texas. In 1872, Reverend Jack Yates led a community-wide effort to purchase land for Juneteenth in Houston. These efforts created Emancipation Park, which continues to be a prominent public park whereamong other activitiesJuneteenth is still celebrated. In 1909, a similar committee led a public effort to create an Emancipation Park for Juneteenth festivities in Austin. Officers and Directors of Emancipation Park Association, 1909], Photograph, 1909; digital image, (http://texashistory.unt.edu/ark:/67531/metapth124576/ : accessed June 06, 2014), University of North Texas Libraries, The Portal to Texas History, http://texashistory.unt.edu; crediting Austin History Center, Austin Public Library, Austin, Texas. In Galveston, many of the Juneteenth celebrations will take place in Jack Johnson Park. Dedicated in 2012, the park demonstrates a continued commitment to celebrating African American history on Juneteenth in a cherished community space. The parks namesake, Jack Johnson, was a Galveston native and athlete who became the first African American to win the Heavyweight Boxing Championship in 1908. Musical traditions at Juneteenth do not stop at spirituals and hymns. 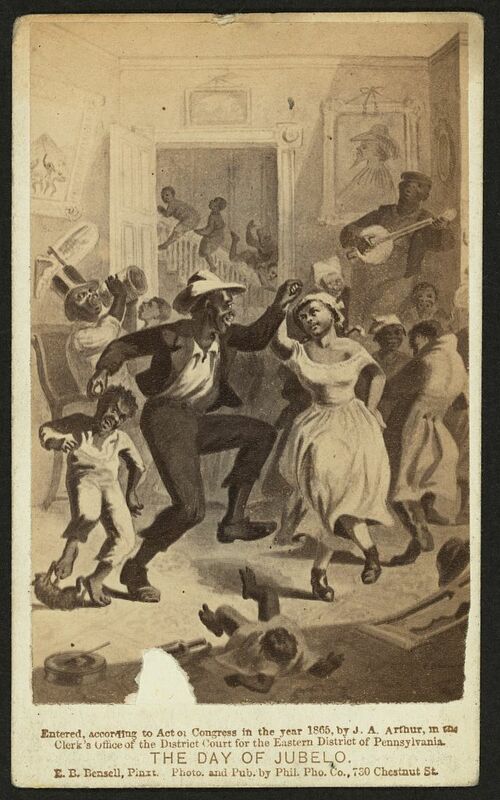 Music and dance were crucial to early Juneteenth celebrations. Festivities often included singing patriotic songs, like the national anthem, or abolitionist songs. At a Juneteenth celebration in Kansas in 1895, the Parsons Weekly Blade reported that attendees sang Hold the Fort and John Browns Body together before listening to a presentation on the history of Juneteenth. Stephenson, Mrs. Charles (Grace Murray). [Emancipation Day Celebration band, June 19, 1900], Photograph, June 19, 1900; digital image, (http://texashistory.unt.edu/ark:/67531/metapth124054/ : accessed June 06, 2014), University of North Texas Libraries, The Portal to Texas History, http://texashistory.unt.edu; crediting Austin History Center, Austin Public Library, Austin, Texas. Modern Juneteenth celebrants often enjoy jazz, blues, zydeco or other various genres that memorialize African American contributions to music. Zydeco is a distinctive musical style that evolved out of Creole communities in Louisiana and Texas, so it is especially linked to many Juneteenth celebrations. Popular zydeco artist CJ Chenier performed in Houston in 2013 for Juneteenth, and you can hear his performanceprominently featuring instruments such as the washboard and the accordionat the Smithsonian Folklife Festival in Washington, D.C. . Over the past three decades, Houston has also hosted a variety of prominent blues musicians, like Lightnin Hopkins and Albert Collins, in honor of Juneteenth. Multitudes of other local and national artists have contributed to the musical commemorations on Juneteenth. In 1982, the Big Budweiser Superfest headlined by Stevie Wonder and Quincy Jones, called the worlds number one rhythm and blues music festival by the Chicago Metro News, played the Cotton Bowl for the Dallas Juneteenth celebration. Newspaper caption: “Festival goers to the Juneteenth Celebration and Black Music Month, jam to the sounds of George Clinton who was the main headliner for the Celebration where over 200,000 people attended.” 1993. Special Collections and Archives, Georgia State University Library. AJCPov01-030H, Atlanta Journal Constitution Photographic Archives. Special Collections and Archives, Georgia State University Library. Regardless of age, race, religion or ethnicity, food has long been a familiar componentif not a focal pointon holidays. For many African Americans, Juneteenth is a special opportunity to celebrate the unique and monumental contributions enslaved people made to American cuisine. Numerous blogs, articles and cookbooks recommend a variety of dishes and drinks for Juneteenth that have become popular, including barbeque, strawberry soda, red rice, and cakes. Popular chefs, such as Kitchen Diva Angela Shelf Medearis, have contributed to the growing tableau of foods enjoyed on Juneteenth. Galveston will host its annual Annie Mae Charles Juneteenth Picnic on June 19 and continue the tradition of food, family and homage. Cant make it to Galveston this year? Check out NationalJuneteenth.com to find events near you. About the author: Christina Regelski has Bachelor’s degrees in History and Archaeology from the University of Virginia and a Master’s degree in History from George Mason University. She will begin her Ph.D. in History at Rice University in August 2014, where her work will focus on race, gender and material culture in the eighteenth and nineteenth-century American South. Christina has a background in museum education and she is passionate about public history and digital history. To learn more about other holidays that commemorate emancipation, see Henry Louis Gates, Jr, What is Juneteenth, The Root (June 17, 2013) http://www.theroot.com/articles/history/2013/06/what_is_juneteenth.html. To learn more about slavery in Texas, see Randolph B. Campbell, An Empire for Slavery: The Peculiar Institution in Texas (Baton Rouge: Louisiana State University Press, 1989). To learn more about the various ways the Emancipation Proclamation affected Texas before June of 1865, see W. Caleb McDaniel, Before Juneteenth: The Emancipation Proclamation in Texas. http://wcm1.web.rice.edu/before-juneteenth-talk.html. To learn more about the legal debates in Texas over emancipation, see Randolph B. Campbell, The End of Slavery in Texas: A Research Note, The Southwestern Historical Quarterly 88.1 (July 1984): 71-80. Jon, Wiener, Civil War, Cold War, Civil Rights: The Civil War Centennial in Context, in Memory of the Civil War in American Culture (Chapel Hill, NC: University of North Carolina Press, 2004), 238. Wiener, Civil War, Cold War, Civil Rights, 248-253. Emancipation Park, Houston Parks and Recreation Department. http://www.houstontx.gov/parks/ourparks/emancipationpark.html. Turner, Juneteenth, 152-53; Emancipation Proclamation for the Baptist of Texas, June 4, 1892, Texas Newspaper Collection, Dolph Briscoe Center for American History, Austin, Texas. Local and Personal News, Parsons Weekly Blade (Kansas), June 22, 1895, 4. To learn more about Lightnin Hopkins, see John Wheat, Lightnin Hopkins: Blues Bard of the Third Ward, in Juneteenth Texas: Essays in African-American Folklore, ed.By Aberneth, Francis Edward, Carolyn Fiedler Satterwhite, Patrick B. Mullen, and Alan B. Govenar. (Denton: University of North Texas, 1996), 240-242. Superfest expands to 11 cities, Chicago Metro News, June, 5 1982, 20. William H. Wiggins, Jr., Juneteenth: A Red Spot Day on the Texas Calendar, in Juneteenth Texas: Essays in African-American Folklore, ed.by Aberneth, Francis Edward, Carolyn Fiedler Satterwhite, Patrick B. Mullen, and Alan B. Govenar. (Denton: University of North Texas, 1996), 240-242. This is the most accurate beneficial article on Juneteenth. can you e-mail me lacpac2011@yahoo.com. Look at the history of Dowling street and fourth ward in Houston.